If you’re coming to the Gold Coast for a holiday, this Broadbeach holiday accommodation for families might be perfect for you. 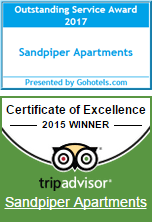 Sandpiper beachfront apartments have spacious one and two bedroom apartments, most with views overlooking the Pacific Ocean. Apartments on the lower floors have beautiful views of the Sandpiper Apartment gardens with Kurrawa Park looking beyond. 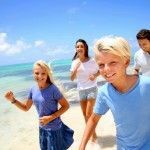 Sandpiper offers family friendly accommodation and a central Gold Coast location at Broadbeach from which to base your holiday adventures. The Gold Coast theme parks such as Movie World and Wet ‘n’ Wild are an easy twenty minute drive to the shire of Oxenford from the Sandpiper Beachfront Apartments. Sandpiper beachfront apartments have a great heated outdoor swimming pool. The pool area will keep the kids entertained anytime, the water is kept at a lovely year round temperature of 29-30° celsius. For adults, the accompanying spa is kept at a consistent 37° celsius. The pool area is also a great place to spend the day. Take a break from the holiday madness and enjoy some time relaxing poolside. Or keep your plans local with an excursion to the beach directly in front of the Sandpiper, or perhaps wander a few hundred metres to Surfers. Burleigh Heads is also a good place to visit. There’s superb views view from there, and its a popular spot for lookout for spotting migrating humpback whales whales. Burleigh Heads beach is beautiful and is a safe spot for swimming and sun bathing. There’s also rock pools at low tide for the kids to go exploring. Next door, Tallebudgera Creek has a stunning waterhole that is very popular. Make sure to take your togs and a picnic lunch, Burleigh Heads is a really nice excursion that the locals like to keep a secret. Whether you’ve come for a big theme park adventure, or to just get away from it all, the Gold Coast is the complete package. 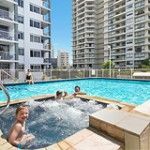 This Broadbeach holiday accommodation for families at the Sandpiper beachfront apartments really does tick all the boxes. Go on, you and your family will love it. Book now.